Every now and then I stumble upon a small, off the beaten path, sanctuary in Bethesda and this is just one of those places. A place where you can forget you’re in a bustling place like Bethesda and just relax. And, as a yoga instructor would say, “just breathe.” This respite is located in a courtyard between Old Georgetown Road, Woodmont and Wisconsin Avenues. Many years ago I took my daughters to the Original Pancake House (a topic of a future blog for sure) for the first time. There was a long line so we had to wait outside and it was then that we first discovered this great little “park” nestled between the tall office buildings. The “park,” or courtyard really, is located just outside the entrance to the Original Pancake house and is tucked away from the street a bit. You have to climb a staircase to find it (if you are coming from Woodmont Avenue) or use the pedestrian bridge that traverses the South side of Old Georgetown Road with the North end at the Metropolitan apartment building (see map). 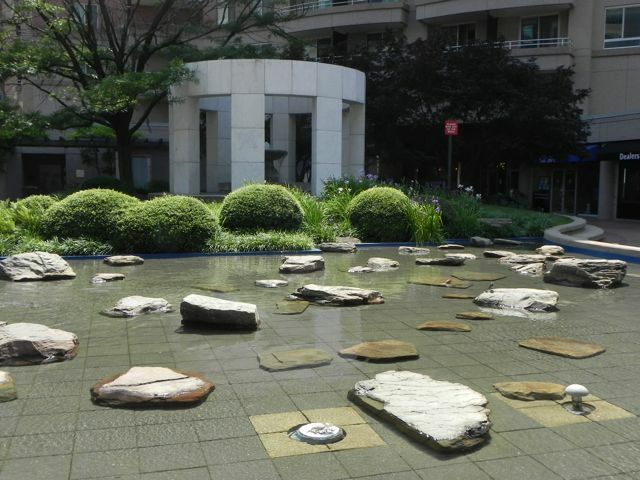 Those many years ago while the girls and I waited our turn to be called for breakfast they laughed and enjoyed walking along the edge of the fountain –tempting fate with the water below (an impressive 6″ deep). They even jumped across the water on a few of the large stepping-stones once they built up their courage. This entry was posted on Sunday, June 26th, 2011 at 11:56 pm and is filed under Kid's Stuff. You can follow any responses to this entry through the RSS 2.0 feed. You can leave a response, or trackback from your own site.